Persistence Market Research provides key insights and forecast on the global Huber needles market for the forecast period 2017-2024. The primary objective of this report is to offer key market dynamics playing an important role in the global market for Huber needles during 2017–2024. A study also offers recent updates and in-depth analysis of all the factors impacting the growth of the market between 2017 and 2024. The report offers details on the performance of the global huber needles market in terms of value and volume. 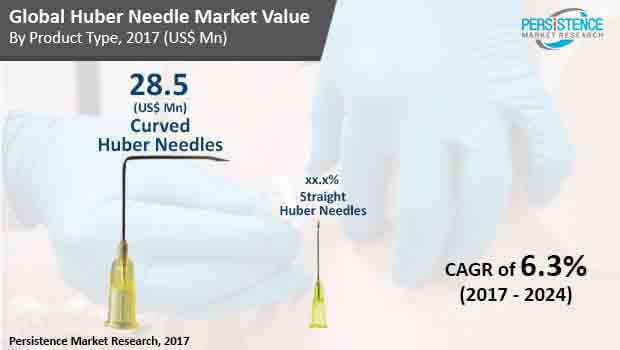 The report also provides an impact analysis of the latest trends, market drivers, challenges, and growth opportunities in the global market for huber needles. The first section of the report is an overview of the global market and the factors influencing demand and supply of Huber needles globally. This section offers details on the growth opportunities in the global huber needles market along with the key market dynamics. Strategic recommendations for leading players operating in the global market for huber needles is also provided in the report to understand how the companies are competing in the global market. The report provides analysis of every segment and sub-segment in the global Huber needles market in terms of yearly growth, market size, incremental opportunity, basis point analysis, and market attractiveness index. The report sheds light on the growth trends in the global market for Huber needles on the basis of region and offers the market outlook for 2017–2024. The report focuses on all the key regions and countries playing an important role in the growth of the market worldwide. It also offers details on the drivers resulting in the market growth in each region. The last section of the report offers detailed profiles of all the key companies in the global huber needles market. Product portfolio, financial overview, latest developments, long-term and short-term strategies by the companies in the global market for Huber needles. The report provides data on the market for the forecast period 2017–2024. All the data included in the report is based on primary and secondary research. Triangulated data on the basis of demand and supply of the product in the market is provided. Key pointers such as adoption of treatment, Huber needles used each year, diagnosis rate, etc., have been considered to provide accurate market numbers. Owing to the fluctuating nature of the global economy, the report provides estimated CAGR, and analysis on the global market for Huber needles based on Y-o-Y growth to identify growth opportunities in the market. In order to understand each and every segment given in the report, analysis of the market segments in terms of basis point share is provided in the report. This information is critical to understand latest trends leading the global huber needles market. A comprehensive analysis in terms of incremental opportunity is offered in the report. Incremental opportunity helps in identifying key opportunities and all the potential resources available in the market from a sales point of view. The report helps to understand the performance and growth of the global Huber needles market throughout the forecast period with help of market attractiveness index. This makes it easy to identify opportunities in the global market for Huber needles. Owing to the convenience and inherent advantages, Huber needles are witnessing a growth worldwide. Huber needles are being widely used with an increase in patients undergoing chemotherapy treatment. Manufacturers of Huber needles are focusing on safety and comfort for patients while developing Huber needles. Hence, innovation in design and specially lubricated Huber needles are being developed by manufacturers to reduce the penetration force and pain caused while the needle is inserted. Manufacturers are also focusing on using standardized coring test. This can help companies to develop a well-tested product, avoiding adverse health effects. Manufacturers are also selling Huber needles with specification on the compatibility of Huber needle with specific ports. In case of cancer, Huber needles are finding large application in intravenous cancer treatments and in blood transfusion. The U.S. is the largest market for Huber needles. However, the fastest growth in the market for Huber needles is seen in India and China. Meanwhile, in Latin America, Brazil is expected to remain dominant. Owing to the availability of the largest private health insurance in Brazil compared to other countries in Latin America. Expansion of health insurance in the country is driving the demand for medical devices and equipment. New cancer cases are being reported every year across the world, this is also contributing to the growth of the global market for Huber needles. According to the report by Persistence Market Research, the global Huber needles market is likely to see a strong growth between 2017 and 2024. The market is also projected to bring in US$ 55.0 Million revenue by 2024 end. Huber needles are available in two forms including straight and curved. Straight needles are usually finding application in short-term procedures. However, the curved Huber needles are used to deliver nutritional fluids, medications and in chemotherapy. Curve needles are more convenient than straight needles as they can be left in the place for few days. It also prevents the need to stick many needles. In recent time, increasing number of people have found to be suffering from cancer and other deadly diseases. This has resulted in a rise in the delivery of chemotherapy fluids and medication fluids, thereby, fueling the demand for Huber needles. Diagnosis and access to the high-quality chemotherapy treatment are increasing across the globe. According to the estimation from International Agency for Research on Cancer (IARC), the globally by 2030, new cases of cancer are expected to increase to 21.7 million. Increase in smoking, physical inactivity and poor lifestyle are some of the factors driving the cancer growth globally. With increasing cases of cancer, the number of people undergoing a chemotherapy will also increase. This is likely to drive the demand for all the medical devices and equipment used in chemotherapy. Manufacturers are working on improving the quality of Huber needles. Special non-coring Huber needles are being developed to make it possible to access port system. Also, more than 2000 punctures are possible by using non-coring Huber needles. Anti-coring Huber needle tests are also being used on a large scale by manufacturers worldwide.